This weekend, down at Fort York in downtown Toronto, the inaugural Conscious Food Festival is happening. Both my brother and I had scored free passes, so we met up to see what it was all about, and bought a bunch of sample vouchers. 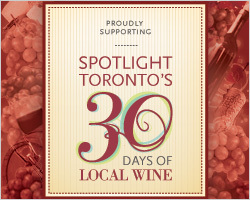 Beyond their manifesto, the event brought together local food and beverage producers, and eaters, to enjoy some of the bounty Ontario has to offer. My overall impression of the event is definitely positive. It wasn't crowded, but that's to be expected for a first-time festival; and was also a good thing. The vibe down at Fort York was definitely chill and easy-going, with a lot of engaged and friendly people. My brother and I struck up conversations with a few people there, both vendors and attendees. The Foodland Ontario cooking demo tent was a nice surprise, and we managed to catch the tail end of a grilled fruit demo, where we scored some of the leftover nectarines. Good gravy, was that thing sweet and juicy! 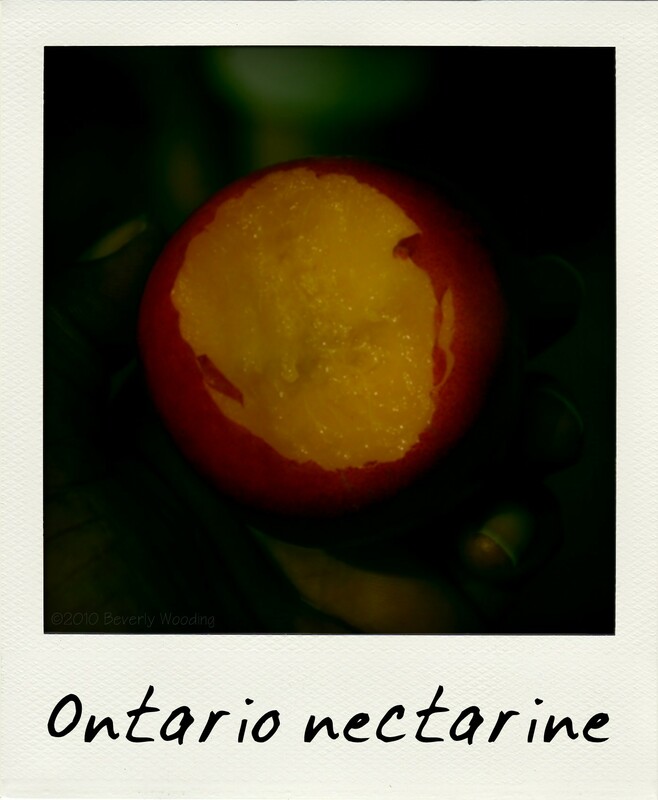 Much like this year's crop of Ontario peaches, the nectarines seem to have benefited from the extended warm weather we experienced. 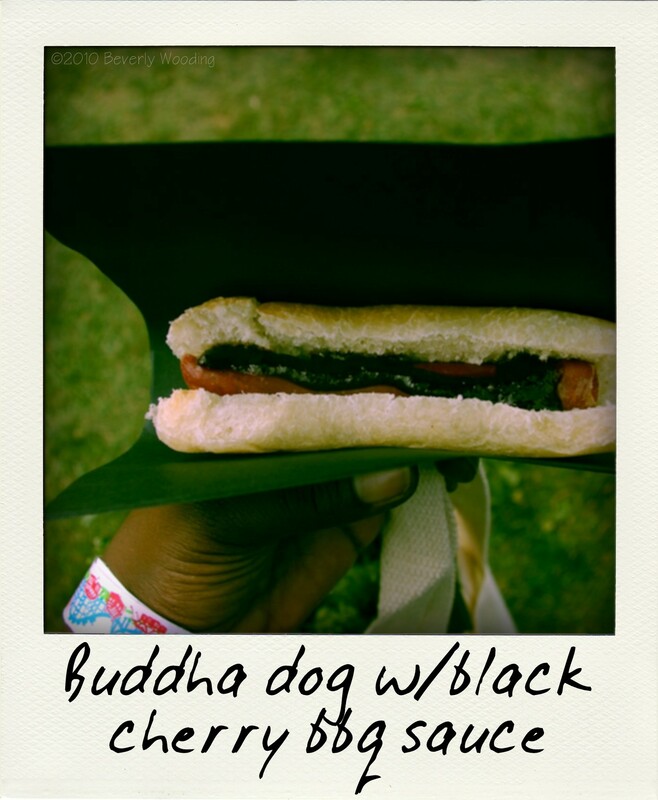 We also tried Buddha Dog's locally-sourced, all-beef hot dogs. My brother went with the wild leek aioli dressing, which was mild, but delicious. I, naturally, went for the black cherry BBQ sauce. Full of the sweet-tart goodness of my favourite fruit, the sauce was balanced out by the tangy bbq sauce and complemented the salty sausage well. 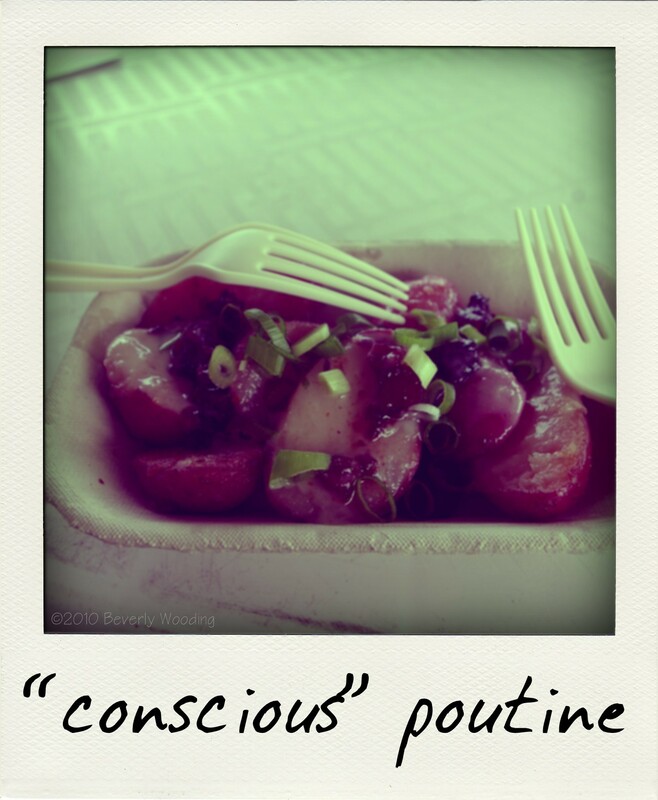 A definite tasting highlight was the "conscious" poutine from Spencer's at the Waterfront in Burlington. Featuring Steve Fetts ruby gold fingerling potatoes, Black River curds, black bow bacon bits and Lomanto's onion gravy, this dish knocked it out of the park. I'm not gonna lie. It's the bacon that pushed it over the top. Sweet, salt, lots of umami, this take on poutine was the dish of the day for both my brother and I. Other yummy things we tried were the '08 Redcoat from Ravine, the cold Oaxaca chocolate drink from ChocoSol, chai ice cream from Mapleton's Organic Dairy, and Cowbell's beermosa. That's right - fresh-squeezed orange juice and Muskoka Hefe-Weissbier. Cutrara and his team are mad geniuses. The Conscious Food Festival is on for one more day, and you can buy tickets online or pay at the gate. I may try and stop by again, as there were quite a few things I didn't get to try, like the cheeses from Fifth Town. Check out the complete list of vendors if you're thinking of attending. I've also posted a few more photos from the event.